This article is about future enlargement. For the enlargement in general, see Enlargement of the European Union. 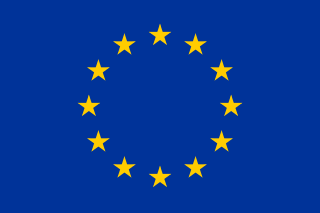 There are five recognised candidates for future membership of the European Union: Turkey (applied on 14 April 1987), North Macedonia (applied on 22 March 2004 as "Former Yugoslav Republic of Macedonia"), Montenegro (applied in 2008), Albania (applied in 2009), and Serbia (applied in 2009). All except Albania and North Macedonia have started accession negotiations. Kosovo, whose independence is not recognised by five EU member states, and Bosnia and Herzegovina are recognised as potential candidates for membership by the EU. Bosnia and Herzegovina has formally submitted an application for membership, while Kosovo has a Stabilisation and Association Agreement (SAA) with the EU, which generally precedes the lodging of membership application. In July 2014, Jean-Claude Juncker announced that the EU had no plans to expand before 2019, while Serbia and Montenegro, the most advanced candidates, are both expected to join before 2025. While the others are progressing, Turkish talks are at an effective standstill. The accession criteria are included in the Copenhagen criteria, agreed in 1993, and the Treaty of Maastricht (Article 49). Article 49 of the Maastricht Treaty (as amended) says that any "European state" that respects the "principles of liberty, democracy, respect for human rights and fundamental freedoms, and the rule of law", may apply to join the EU. Whether a country is European or not is subject to political assessment by the EU institutions. 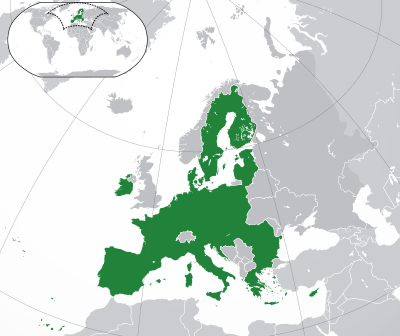 Past enlargement since the foundation of the European Union (EU) as the European Economic Community by the Inner Six states in 1958 has brought total membership of the EU to twenty-eight. The three major western European countries that are not EU members, Iceland, Norway, and Switzerland, have all submitted membership applications in the past, but subsequently froze them. They do however, along with Liechtenstein, participate in the EU Single Market as well as the Schengen Area, which makes them closely aligned with the EU. According to an Eastern Partnership strategy, the EU is unlikely to invite any more of its post-Soviet neighbours to join the bloc before 2020. However, in 2014 the EU signed Association Agreements with Georgia, Moldova, and Ukraine, and the European Parliament passed a resolution recognising the "European perspective" of all three countries. The present enlargement agenda of the European Union regards Turkey and the Western Balkan states of Albania, Bosnia and Herzegovina, Kosovo, North Macedonia, Montenegro and Serbia. These states must negotiate the terms of their EU accession with the current member states, and align their domestic legislation with EU law before joining. Turkey has a long-standing application with the EU, but their accession negotiations have stalled since 2016. This is due to the political issues surrounding the accession of the country. As for the Western Balkan states, the EU had pledged to include them after their civil wars: in fact, two states have entered (Slovenia in 2004 and Croatia in 2013), four are candidates, and the remaining two have pre-accession agreements. There are, however, other states in Europe which either seek membership or could potentially apply if their present foreign policy changes, or the EU gives a signal that they might now be included on the enlargement agenda. However, these are not formally part of the current agenda, which is already delayed due to bilateral disputes in the Balkans and difficulty in fully implementing the acquis communautaire (the accepted body of EU law). In 2005, the European Commission suggested in a strategy paper that the present enlargement agenda could potentially block the possibility of a future accession of Armenia, Azerbaijan, Belarus, Georgia, Moldova, and Ukraine. Olli Rehn has said on occasion that the EU should "avoid overstretching our capacity, and instead consolidate our enlargement agenda," adding, "this is already a challenging agenda for our accession process." It was previously the norm for enlargements to see multiple entrants join the Union at once. The only previous enlargements of a single state were the 1981 admission of Greece and the 2013 admission of Croatia. However, the EU members have warned that, following the significant impact of the fifth enlargement in 2004, a more individual approach will be adopted in the future, although the entry of pairs or small groups of countries will most probably coincide. The 2003 European Council summit in Thessaloniki set integration of the Western Balkans as a priority of EU expansion. This commitment was made in order to stabilise the region in the wake of the Yugoslav Wars, a series of civil wars through the 1990s that led to the breakup of Yugoslavia. Slovenia, the first former Yugoslav country to obtain independence, joined the EU in 2004, followed by Croatia in 2013. Albania, Serbia, North Macedonia, and Montenegro are all candidate states, with Serbia and Montenegro in negotiations. Bosnia and Herzegovina has applied to join but is not yet recognised as a candidate while Kosovo, which declared independence in 2008, is not recognised by all EU states, or Serbia. Serbia and Montenegro are expected to join before 2025. North Macedonia and Albania are expected to start talks by the end of 2019 and could also join by 2025. Turkey's candidacy to join the EU has been a matter of major significance and considerable controversy since it was granted in 1999. Turkey has had historically close ties with the EU, having an association agreement since 1964, being in a customs union with the EU since 1995 and initially applying to join in 1987. Only after a summit in Brussels on 17 December 2004 (following the major 2004 enlargement), the European Council announced that membership negotiations with Turkey were officially opened on 3 October 2005. Turkey is the thirteenth largest economy in the world, it has the second largest military force of NATO and is a key regional power. In 2006, Carl Bildt, Swedish foreign minister, stated that "[The accession of Turkey] would give the EU a decisive role for stability in the Eastern part of the Mediterranean and the Black Sea, which is clearly in the strategic interest of Europe." However others, such as former French President Nicolas Sarkozy and German Chancellor Angela Merkel, maintain an opposition to Turkey's membership. Opponents argue that Turkey does not respect the key principles that are expected in a liberal democracy, such as the freedom of expression. Turkey's large population would also alter the balance of power in the representative European institutions. Upon joining the EU, Turkey's 70 million inhabitants would bestow it the second largest number of MEPs in the European Parliament. Demographic projections indicate that Turkey would surpass Germany in the number of seats by 2020. Turkey also does not recognise one EU state, Cyprus, over the Cyprus dispute and the Cypriot government blocks some chapters of Turkey's talks. Turkey's relations with the EU have seriously deteriorated in the aftermath of the 2016 Turkish coup d'état attempt and subsequent purges. On 24 November 2016 the European Parliament approved a non-binding resolution calling for the "temporary freeze of the ongoing accession negotiations with Turkey" over human rights and rule of law concerns. On 13 December, the European Council (comprising the heads of state or government of the member states) resolved that it would open no new areas in Turkey's membership talks in the "prevailing circumstances", as Turkey's path toward autocratic rule made progress on EU accession impossible. As of 2017, and especially following Erdoğan's victory in the constitutional referendum, Turkish accession talks are effectively at a standstill. Corruption, organised crime, politicisation of the judiciary. Constitution needs significant reform, little agreement about the future of the state. Still under an EU rule-of-law assistance mission, deep political and corruption problems, status is disputed. Still has serious problems with corruption, autocratic system, political and economic progress is moderate. Ongoing dispute over Kosovo, small progress in fighting corruption. negotiating 1964-12-01 (AA) 1987-04-14 1999-12-12 2005-10-03 2006-10-13 1/16 of 33 The Cyprus dispute, among other issues. Planned Turkish policies may violate the Copenhagen criteria of eligibility for membership. Several chapters have had negotiations frozen since 2006. ^ Excluding Chapters 34 (Institutions) and 35 (Other Issues) since these are not legislation chapters. Situation of policy area at the start of membership negotiations (Turkey, reference states), at candidate status recommendation (North Macedonia, Montenegro, Serbia) or membership application opinion (Albania); according to the 1992 Opinion, 1997 Opinions, 1999 Reports, 2005 Reports, 2010 Opinion, 2010 Reports and 2011 Reports. ^ Kosovo is the subject of a territorial dispute between the Republic of Kosovo and the Republic of Serbia. The Republic of Kosovo unilaterally declared independence on 17 February 2008, but Serbia continues to claim it as part of its own sovereign territory. The two governments began to normalise relations in 2013, as part of the Brussels Agreement. Kosovo has been recognized as an independent state by 112 out of 193 United Nations member states. 10 states have recognized Kosovo only to later withdraw their recognition. The European Union remains divided on its policy towards Kosovo, with five EU member states not recognizing its independence. ^ EU Association Agreement type: Stabilisation and Association Agreement (SAA) for the Western Balkans states participating in the Stabilisation and Association process of the EU (Albania, Bosnia and Herzegovina, North Macedonia, Montenegro, Serbia and Kosovo through the STM); Association Agreement and Customs Union for Turkey; European Economic Area (EEA) for Iceland and Finland (reference state of the Fourth Enlargement); Europe Agreement for the reference states of the Fifth Enlargement. ^ Montenegro started negotiations in November 2005 while a part of Serbia and Montenegro. Separate technical negotiations were conducted regarding issues of sub-state organizational competency. A mandate for direct negotiations with Montenegro was established in July 2006. Direct negotiations were initiated on 26 September 2006 and concluded on 1 December 2006. ^ Serbia started negotiations in November 2005 while part of Serbia and Montenegro, with a modified mandate from July 2006. ^ Including anti-discrimination and equal opportunities for men and women. The Maastricht Treaty (Article 49) states that any European country (as defined by a European Council assessment) that is committed to democracy may apply for membership in the European Union. In addition to European states, other countries have also been speculated or proposed as future members of the EU. States in western Europe who have chosen, for various reasons, not to become full members of the EU have integrated with it to different extents according to their circumstances. Iceland, Norway and Liechtenstein participate directly in the single market via the European Economic Area, Switzerland does so via bilateral treaties and the other European microstates (Andorra, Monaco, San Marino, Vatican City) have specific agreements with the EU and neighbouring countries, including their use of the euro as their currency. Most of these countries are also part of the Schengen Area. While this integration is designed as a substitute for full membership, there are ongoing debates in a number of these countries as to whether they should join as full members. Three (Norway, Iceland and Switzerland) have all previously had live applications to join the EU which have been withdrawn or otherwise frozen. Such applications could be resubmitted in the event of a change in the political landscape. Georgia, Moldova and Ukraine ratified an Association Agreement with the EU and the European Parliament passed a resolution in 2014 stating that "in accordance with Article 49 of the Treaty on European Union, Georgia, Moldova and Ukraine, as well as any other European country, have a European perspective and can apply for EU membership in compliance with the principles of democracy, respect for fundamental freedoms and human rights, minority rights and ensuring the rule of rights." They also entered the Deep and Comprehensive Free Trade Area with the EU, that creates "framework for modernising [...] trade relations and for economic development by the opening of markets via the progressive removal of customs tariffs and quotas, and by an extensive harmonisation of laws, norms and regulations in various trade-related sectors, creating the conditions for aligning key sectors" of their economies with EU standards. Main obstacles: Dispute with Azerbaijan regarding Nagorno-Karabakh. Relationship: Deep and Comprehensive Free Trade Area, pursuing membership. Main Obstacles: Dispute regarding South Ossetia and Abkhazia with Russia. Public Opinion: 83% in favour, 9% against (2019 poll). Public Opinion: 25.9% in favour, 54% against (2017 poll). Relationship: Deep and Comprehensive Free Trade Area, pursuing membership Many Moldovans have, or can easily obtain, Romanian (and hence EU) citizenship. Main Obstacles: Transnistrian dispute, Russian political influence. Public Opinion: 40% in favour (2015 poll). Public Opinion: 16% in favour, 66% against (2016 poll). Public Opinion: A referendum in 2013 on applying for EU membership resulted in 50.3% approving, but it failed due to insufficient turnout. Main Obstacles: Swiss public opinion and direct democracy. Public Opinion: A Swiss referendum on restarting EU membership negotiations in 2001 was defeated by 76.8%. Opponents: Opposition Bloc, Right Sector. Public Opinion: 66.4% in favour, 33.6% against (2015 poll). Internal enlargement is the process of new member states arising from the break-up of or secession from an existing member state. There have been and are a number of active separatist movements within member states (for example in Catalonia and Flanders) but there are no clear agreements, treaties or precedents covering the scenario of an existing EU member state breaking into two or more states, both of which wish to remain EU member states. The question is whether one state is a successor and one a new applicant or, alternatively, both are new states which must be admitted to the EU. In some cases, a region desires to leave its state and the EU, namely those regions wishing to join Switzerland. But most, namely the two movements who have had referendums within the 2010s, Scotland and Catalonia, see their future as independent states within the EU. This results in great interest on whether, once independent, they would retain EU membership or conversely whether they would have to re-apply. In the later case, since new members must be approved unanimously, any other state which has an interest in blocking their membership to deter similar independence movements could do so. Additionally, it is unclear whether the successor state would retain any opt-outs that the parent state was entitled to. Jean-Claude Juncker, President of the European Commission: “If there were to be a ‘yes’ vote in favour of Catalan independence, then we will respect that opinion. But Catalonia will not be able to be an EU member state on the day after such a vote.” This was repeated in October in an official press release: "We [...] reiterate the legal position held by this Commission as well as by its predecessors. If a referendum were to be organised in line with the Spanish Constitution it would mean that the territory leaving would find itself outside of the European Union." Jose Manuel Barroso, President of the European Commission (2004-2014), stated in 2012 in the context of the 2014 referendum for independence in Scotland, that any new independent country would have to apply for membership and negotiate its terms, but that the rest of the original country would not have to re-negotiate its position and would continue its membership. In 2014 he said that it would have been 'very difficult' for an independent Scotland to join the EU, 'if not impossible', because of the difficulty of getting the approval of all member states, particularly Spain, which fears a possible secession of Catalonia and has blocked Kosovo's accession to the EU. Joaquin Almunia (Spanish, being at the time an EU Commissioner) in 2013 claimed that Catalonia would have to apply for EU membership in the event of secession from Spain. Spanish Prime Minister Mariano Rajoy, said in November 2013 that an independent Scotland's entry to the EU would require the consent of all existing members and that an independent Scotland or other regions gaining independence, taken as a reference to Catalonia, would end up outside of the EU. The UK Government's legal advice on the issue was that 'Since the [remainder of the UK] would be the same state as the UK, its EU membership would continue', while speculating that 'On the face of it, Scotland would be required to accede to the EU as a new state, which would require negotiations on the terms of its membership ...', but that 'Scotland's position within the EU is likely to be shaped more by any agreements between the parties than by pre-existing principles of EU law.' Without any formal process for handling the breakup of any member state, the European Commission offered, if requested by a member state, to provide an official view on the EU's position on Scottish EU membership in the event of its independence from the UK. The Scottish Government requested that UK Prime Minister David Cameron place this request, but such a request was not made. Deputy First Minister for Scotland, the SNP's Nicola Sturgeon, said that the SNP Cabinet did not agree an independent Scotland would have to reapply for EU membership. Yes Scotland: The "Yes" campaign, led by Blair Jenkins, argued that Scotland would continue as a member state following a Yes vote as Scotland would remain compliant with all EU Principles as outlined in TEU Article 2 and there are no provisions to exclude a state in the existing EU agreements. During the period between a Yes vote and formal independence, the Scottish Government could engage in negotiations, from within the EU, on the terms of their continuing membership in the EU. Several EU heads of state expressed their opinion that this position was reasonable, as did James Crawford, co-author of the UK government's legal advice on the issue. In an interview on BBC Radio, asked if the timescale of 18 months for EU and other treaty organisation was possible, Crawford replied that he felt the timescale was reasonable. However, there was no official comment on this view from the EU Commission. The Scottish SNP Government and the Yes Campaign both declared that continuation of membership in the EU is their preference. Better Together: The "No" campaign, led by Alistair Darling, argued that any vote for independence would have automatically placed Scotland out of the EU as a new state, and Scotland would have had to renegotiate entry. The Scottish Independence Referendum of 2014 was the first occasion the EU was faced with the potential breakup of a member state, and one where the region declaring independence wished to retain its EU membership. While the UK's intended withdrawal from the EU would also take Scotland out of the EU, the debates in the referendum campaign may inform other future scenarios. On 1 October 2017, the Catalan government held a referendum on independence, which had been declared illegal by the Constitutional Court of Spain, with potential polling stations being cordoned off by riot police. The subsequent events constituted a political crisis for Catalonia. The EU's position is to keep distance from the crisis while supporting Spain's territorial integrity and constitution. While the debate around Scotland's referendum may inform the Catalan crisis, Catalonia is in a distinct situation from Scotland whereby the central government does not recognise the legitimacy of any independence declaration from Catalonia. If Spain does not recognise the independence of a Catalan state, both Catalonia cannot separately join the EU and it is still recognised as part of Spain's EU membership. There is an active movement towards Flemish independence, or union with the Netherlands, with the future status of Wallonia and Brussels (the de facto capital of the EU) unclear as viable political states, perhaps producing a unique situation from Scotland and Catalonia. There are various proposals for what should happen to the city, ranging from staying part of the Belgian rump state, to joining the hypothetical Flemish state, to becoming a separate political entity. Officially, the island nation Cyprus is part of the European Union, under the de jure sovereignty of the Republic of Cyprus. Turkish Cypriots are citizens of the Republic of Cyprus and thus of the European Union, and were entitled to vote in the 2004 European Parliament election (though only a few hundred registered). The EU's acquis communautaire is suspended indefinitely in the northern third of the island, which has remained outside the control of the Republic of Cyprus since the Turkish invasion of 1974. The Greek Cypriot community rejected the Annan Plan for the settlement of the Cyprus dispute in a referendum on 24 April 2004. Had the referendum been in favour of the settlement proposal, the island (excluding the British Sovereign Base Areas) would have joined the European Union as the United Cyprus Republic. The European Union's relations with the Turkish Cypriot Community are handled by the European Commission's Directorate-General for Enlargement. The European Council has recognized that if the UK withdraws from the EU as expected, then were Northern Ireland to be incorporated into the Republic of Ireland to form a united Ireland it would automatically rejoin the EU under Ireland's membership. This is consistent with the incorporation of East Germany into the Federal Republic of Germany as a single EU member state. A similar scenario has been envisioned with the unification of Romania and Moldova, which would incorporate the current territory of Moldova into Romania and thus into the EU. There are multiple Special member state territories, some of them are not fully covered by the EU treaties and apply EU law only partially, if at all. It is possible for a dependency to change its status regarding the EU or some particular treaty or law provision. The territory may change its status from participation to leaving or from being outside to joining. The only country with the status of British Overseas Territory that is part of the EU is Gibraltar, which joined the EEC together with the United Kingdom in 1973. The other overseas territories are defined as Overseas Countries and Territories of the EU. All of them are associated with the EU (meaning they apply some parts of EU law) and their nationals are in principle EU citizens. Special terms were negotiated for the Channel Islands and the Isle of Man on the UK's accession to the European Economic Community. These are contained in Protocol 3 to the Treaty of Accession 1973. The effect of the protocol is that the Channel Islands and the Isle of Man are within the Common Customs Area and the Common External Tariff (i.e. they enjoy access to European Union countries of physical exports without tariff barriers). Other Community rules do not apply to the Islands. The UK Sovereign Base Areas, Akrotiri and Dhekelia on Cyprus did not join the European Union when the United Kingdom joined. Cyprus' Accession Treaty specifically stated that this would not change with the accession of Cyprus to the European Union. However, currently, some provisions of the EU Law are applicable there—mainly border management, food safety and free movement of people and goods. The Faroe Islands, a self-governing nation within the Kingdom of Denmark, are not part of the EU, as explicitly asserted by both Rome treaties. The relations with the EU are governed by a Fisheries Agreement (1977) and a Free Trade Agreement (1991, revised 1998). The main reason for remaining outside the EU is disagreements about the Common Fisheries Policy, which disfavours countries with large fish resources. Also, every member has to pay for the Common Agricultural Policy, which favours countries having much agriculture which the Faroe Islands does not. When Iceland was in membership negotiations around 2010, there was a hope of better conditions for fish-rich countries, but this came to nothing. The Common Fisheries Policy was introduced in 1970 for the very reason of getting access for the first EC members into waters of candidate countries, UK, Ireland and Denmark with the Faroe Islands. Nevertheless, there are politicians, mainly in the right-wing Union Party (Sambandsflokkurin), led by their chairman Kaj Leo Johannesen, who would like to see the Faroes as a member of the EU. However, the chairman of the left-wing Republic (Tjóðveldi), Høgni Hoydal, has expressed concerns that if the Faroes were to join the EU as is, they might vanish inside the EU, comparing this with the situation of the Shetland Islands and Åland today, and wants the local government to solve the political situation between the Faroes and Denmark first. Greenland, a self-governing community that is part of the Kingdom of Denmark, entered the EC with Denmark in 1973, because it had no local independence at that time. After the establishment of Greenland's home rule in 1979 (effective from 1980), it held a second referendum on membership. The result was (mainly because of the Common Fisheries Policy) to leave, so on 1 February 1985, Greenland left the EEC and EURATOM. Its status was changed to that of an Overseas Country. Danish nationals residing in Greenland (i.e. all native population) are nonetheless fully European citizens; they are not, however, entitled to vote in European elections. There has been some speculation as to whether Greenland may consider rejoining the European Union. On 4 January 2007 the Danish daily Jyllands-Posten quoted the former Danish minister for Greenland, Tom Høyem, as saying "I would not be surprised if Greenland again becomes a member of the EU... The EU needs the Arctic window and Greenland cannot alone manage the gigantic Arctic possibilities". Greenland has a lot of natural resources, and Greenland has, especially during the 2000s commodities boom, contracted private companies to exploit some of them, but the cost is considered too high, as Greenland is remote and severely lacks infrastructure. After 2013 prices have declined so such efforts have stalled. The Brexit debate has reignited talk about the EU in Greenland, and there have been calls for the island to rejoin the Union. The islands of Aruba, Curaçao, and Sint Maarten are constituent countries of the Kingdom of the Netherlands, while Bonaire, Sint Eustatius and Saba are special Dutch municipalities. All are Overseas Countries and Territories (OCT) under Annex II of the EC treaty. OCTs are considered to be "associated" with the EU and apply some portions of EU law. The islands are opting to become an Outermost Region (OMR) of the EU, the same status the Azores, Madeira, the Canary Islands and the French overseas departments have. When Bonaire, Sint Eustatius and Saba were established as Dutch public bodies after the dissolution of the Netherlands Antilles (which was an OCT) in 2010, their status within the EU were raised. Rather than change their status from an OCT to an outermost region, as their change in status within the Netherlands would imply, it was decided that their status would remain the same for at least five years. After those five years, their status would be reviewed. If it was decided that one or all of the islands wish to integrate more with the EU then the Treaty of Lisbon provides for that following a unanimous decision from the European Council. Former European Commissioner for Enlargement Danuta Hübner has said before the European Parliament that she does not expect many problems to occur with such a status change, as the population of the islands is only a few thousand people. The territories of French Guiana, Guadeloupe, Martinique, Mayotte and Réunion are overseas departments of France and at the same time mono-departmental overseas regions. According to the EC treaty (article 299 2), all of these departments are outermost regions (OMR) of the EU—hence provisions of the EC treaty apply there while derogations are allowed. The status of the Overseas collectivity of Saint-Martin is also defined as OMR by the Treaty of Lisbon. New Caledonia and the overseas collectivities of French Polynesia, Saint-Barthelemy, Saint Pierre et Miquelon and Wallis and Futuna are Overseas Countries and Territories of the EU. New Caledonia is an overseas territory of France with its own unique status under the French Constitution, which is distinct from that of overseas departments and collectivities. It is defined as an "overseas country" under the 1998 Nouméa Accord, and enjoys a high degree of self-government. Currently, in regard to the EU, it is one of the Overseas Countries and Territories (OCT). As a result of the Nouméa Accord, New Caledonians voted on an independence referendum scheduled for November 2018. This referendum determined whether the territory would remain a part of the French Republic as a "sui generis collectivity", or whether it would become an independent state. The accords also specify a gradual devolution of powers to the local New Caledonian assembly. The referendum's result was that New Caledonia would remain a part of the French Republic. ^ a b "EU candidate status for Albania". European Commission. 24 June 2014. Retrieved 27 June 2014. ^ "Countries preparing to join - The former Yugoslav Republic of Macedonia". European Commission. 27 June 2013. Retrieved 16 January 2015. ^ a b EU advances membership talks for Montenegro, Serbia, Euractiv 11 December 2017. ^ a b "Turkey's EU dream is over, for now, top official says". Reuters. 2 May 2017. ^ a b Richard Balmforth and Natalia Zinets. Ukraine president sets 2020 as EU target date, defends peace plan. Reuters. 25 September 2014. ^ ""Turkey is no longer an EU candidate", MEP says". Euronews. 10 April 2017. Retrieved 15 April 2017. ^ "Euractiv.com". Euractiv.com. Archived from the original on 6 July 2008. Retrieved 7 January 2011. ^ "Potential candidates". European Union. Archived from the original on 28 October 2011. ^ "2005 enlargement strategy paper". European Union. ^ "EU enlargement chief vows to press ahead, for 'stability'". International Herald Tribune. 1 February 2006. ^ "European Union, Community Law And International Business Law" (PDF). European Center for Peace and Development. p. 46. ^ "My country & NATO: Turkey". NATO. Archived from the original on 16 December 2008. ^ a b c "Turkey, America and Europe: Who is losing Turkey?". The Economist. 28 September 2006. Retrieved 7 January 2011. ^ Bhalla, Reva; Goodrich, Lauren; Zeihan, Peter (17 March 2009). "Turkey and Russia on the Rise". Stratfor. Archived from the original on 23 August 2011. ^ Friedman, George (31 July 2007). "The Geopolitics of Turkey". Stratfor. Archived from the original on 10 October 2009. ^ "BBC: EU hails Turkey free speech move. 30 April 2008". BBC News. 30 April 2008. Retrieved 7 January 2011. ^ "Turkey's bid to join the EU is a bad joke; but don't kill it". The Economist. 13 October 2016. ^ "EU-Turkey Relations Reaching a Crossroads". Carnegie. 11 April 2017. ^ "P8_TA(2016)0450". European Parliament. 24 November 2017. Retrieved 11 November 2017. ^ "Freeze EU accession talks with Turkey until it halts repression, urge MEPs". European Parliament. ^ "EU parliament votes overwhelmingly in favour of scrapping Turkey accession talks". The Telegraph. Retrieved 8 December 2016. ^ ""Turkey is no longer an EU candidate", MEP says". EuroNews. 10 April 2017. ^ "A truce with the EU?". Daily SabahEuroNews. 2 May 2017. ^ "Current negotiations status". European Commission. 24 January 2016. Retrieved 26 July 2016. ^ "General Affairs Council - Statement" (PDF). Council of the European Union. 26 June 2018. Retrieved 26 June 2018. ^ "European Commission - Statement". European Commission. 15 February 2016. Retrieved 15 February 2016. ^ European Council agreed that, pending the implementation of the Prespa agreement, negotiations could begin by the end of June 2019. ^ "Serbia starts negotiations to join EU". B92. 21 January 2014. Retrieved 21 January 2014. ^ "Republic of Turkey Ministry for EU Affairs". ^ "Government of the Republic of Macedonia Secretariat for European Affairs". ^ "Montenegro Ministry of Foreign Affairs and European Integration". ^ "Government of the Republic of Serbia European Integration Office". ^ "Republic of Albania Ministry of Integration". ^ "Directorate for European Integration". ^ "Republic of Kosovo Ministry of European Integration". ^ "EUR-Lex - 21996D0213(01) - EN". Eur-lex.europa.eu. Retrieved 16 September 2013. ^ "Serbia Moves Closer to Joining E.U." www.nytimes.com. Retrieved 16 September 2013. ^ "Council conclusions on the application of Bosnia and Herzegovina for membership of the EU". Council of the European Union. Retrieved 20 September 2016. ^ "Hahn: Questionnaire is a game changer for future of BiH". Delegation of the European Union to Bosnia and Herzegovina. Retrieved 9 December 2016. ^ "Albania: EU Commission OKs status of membership candidate". www.ansamed.info. Retrieved 16 October 2013. ^ "Montenegro is officially awarded EU candidate status". euobserver.com. Retrieved 16 September 2013. ^ "EU candidate status for Albania". European Commission. 24 June 2014. Retrieved 27 June 2014. ^ "EUROPEA COUCIL 26/27 JUE 2014 COCLUSIOS" (PDF). European Council. 27 June 2014. Retrieved 11 November 2016. ^ Pawlak, Justyna. "EU opens to Serbia after Kosovo deal | Reuters". Uk.reuters.com. Retrieved 16 September 2013. ^ "COMMUNICATION FROM THE COMMISSION TO THE EUROPEAN PARLIAMENT, THE COUNCIL, THE EUROPEAN ECONOMIC AND SOCIAL COMMITTEE AND THE COMMITTEE OF THE REGIONS" (PDF). europa.eu. 9 November 2016. Retrieved 9 November 2016. ^ a b c d Gotev, Georgi (27 June 2018). "EU puts 'North Macedonia' and Albania on hold until the European elections". Euractiv.com. Retrieved 27 June 2018. ^ "Council conclusions on Montenegro" (PDF). ue.eu.in. Retrieved 16 September 2013. ^ "Council conclusions on Enlargement and Stabilisation and Association Process" (PDF). Council of the European Union. 17 December 2013. Retrieved 17 December 2013. ^ "Conditions for membership". European Commission. Retrieved 21 December 2014. ^ a b c d e "Georgia can apply for EU membership if it complies with democratic principles". ^ < EU-Ukraine Deep and Comprehensive Free Trade Area[permanent dead link]. trade.ec.europa.eu. ^ "Armenia-EU finalize new deal". Asbarez. Asbarez News Agency. 3 October 2018. Retrieved 3 October 2018. ^ "About Us". Heritage Party Website. Archived from the original on 30 May 2014. ^ Kucera, Joshua (26 April 2018). "Armenia's "Velvet Revolution" keeps peace with Russia - for now". Eurasianet. ^ "Armenia Not to Join NATO, EU: President". ChinaView. 24 April 2006. Retrieved 25 June 2007. ^ "The South Caucasus Between The EU And The Eurasian Union". Gallup Poll. Panorama. 3 April 2017. Retrieved 3 April 2017. ^ "Georgia-EU association agreement initialled". ^ "Georgia can be full EU member in 5–10 years". ^ "Russia's opposition to Georgia's EU integration". Worldview.stratfor.com. 6 December 2013. Retrieved 20 September 2018. ^ "NDI Poll: EU, NATO support at a 5-year high in Georgia". Archived from the original on 28 January 2019. Retrieved 2 February 2019. ^ "Two-thirds reject EU membership". Retrieved 8 February 2018. ^ Phinnemore, David (21–23 September 2006). "Moldova: a step too far for EU enlargement?" (PDF). 3rd Pan-European Conference on EU Politics, Istanbul, Turkey. Johns Hopkins University. Archived from the original (PDF) on 17 July 2011. Retrieved 1 August 2010. ^ Klussmann, Uwe (4 February 2009). "Reunification with Romania? EU Dreams in Communist Moldova". Der Spiegel. Retrieved 1 August 2010. ^ "Moldova wants to join EU in 2019". The Straits Times. 29 April 2014. Retrieved 14 May 2014. ^ "Igor Dodon: Moldova can not become a member of the EU". ^ "President of Moldova says his country cannot join EU in current form". ^ Tore Bergsaker. "Brexit rokker ikke norsk EU-motstand". Dagbladet. Retrieved 27 August 2016. ^ "Referendum "europeo": Sinistra Unita dice "Sì"". SMtv San Marino. 9 September 2013. Retrieved 15 September 2013. ^ "Referendum Ue: sì convinto dall'Upr". SMtv San Marino. 6 September 2013. Retrieved 15 September 2013. ^ "Civico 10. Su Europa e referendum". 26 September 2013. Archived from the original on 27 September 2013. Retrieved 26 September 2013. ^ "Civico10 sul referendum sull'Europa: vietato votare 'no'". 5 September 2013. Archived from the original on 11 September 2013. Retrieved 15 September 2013. ^ "Congresso Psd: si cerca la mediazione su un nome che rappresenti le diverse anime". SMtv San Marino. 19 September 2013. Retrieved 26 September 2013. ^ "Referendum Europa: il Ps è per il sì". SMtv San Marino. 10 September 2013. Retrieved 15 September 2013. ^ "Referendum 2013: Per San Marino invita a votare sì". SMtv San Marino. 6 October 2013. Retrieved 8 October 2013. ^ "Referendum sull'Europa, Psm spinge verso "l'inizio di una trattativa lunga e difficile"". 5 September 2013. Retrieved 15 September 2013. ^ "DC, maggiore integrazione all'Europa non significa adesione". SMtv San Marino. 20 September 2013. Retrieved 26 September 2013. ^ "Linke lanciert neue EU-Beitrittsdebatte" (in German). baz.online. 8 February 2009. Retrieved 9 February 2009. ^ "Swiss say 'no' to EU". BBC News. 4 March 2001. Retrieved 5 May 2008. ^ Ukraine ratifies EU association agreement. Deutsche Welle. 16 September 2014. ^ Jennifer Rankin in Brussels and Severin Carrell. "Independent Scotland 'would have to apply to join EU' – Brussels official". The Guardian. Retrieved 20 September 2018. ^ Independent Catalonia would need to apply to join EU -Juncker, Reuters 14/SEP/17. ^ "European Commission - PRESS RELEASES - Press release - Statement on the events in Catalonia". europa.eu. Retrieved 9 December 2017. ^ "correspondence from Mr Barroso to the House of lords" (PDF). ^ Nikolaj, Nielsen (17 September 2013). "EU commission: Catalonia must leave EU if it leaves Spain". EUObserver.com. Retrieved 19 September 2013. ^ Johnson, Simon (27 November 2013). "Spanish PM: Independent Scotland would be kicked out of the EU". The Daily Telegraph. London. ^ Graeme Murray (26 February 2012). "Spain will not veto an independent Scotland joining EU". Sunday Express, London. Retrieved 4 September 2014. ^ Crawford, James; Boyle, Alan (10 December 2012). "Annex A - Opinion: Referendumon the Independence of Scotland – International Law Aspects" (PDF). p. 67. Retrieved 19 February 2013. Part I: Executive summary ... 6.1 Since the rUK would be the same state as the UK, its EU membership would continue. Indeed, the EU treaties implicitly preclude ‘automatic’ withdrawal by a state. There might have to be an adjustment to the UK’s terms of membership to reflect its reduction in territory and population, but this could be done without the UK ceasing to be an EU Member State. ^ Crawford, James; Boyle, Alan (10 December 2012). "Annex A - Opinion: Referendum on the Independence of Scotland – International Law Aspects" (PDF). p. 67. Retrieved 19 February 2013. Part I: Executive summary ...6. Within the EU, there is no precedent for what happens when a metropolitan part of a current Member State becomes independent, so it is necessary to speculate. ... 6.2 On the face of it, if Scotland had voted for independence it would have been required to accede to the EU as a new state, which would require negotiations on the terms of its membership, including on the subjects of the UK’s current opt-outs. The EU treaties make no provision for succession to membership. Certain provisions of the EU treaties would require amendment. If Scotland were somehow to become an EU member in its own right automatically, it is not clear how adjustments to the relative positions of Member States could be willed into being without negotiations. Nor would it be clear on what terms it would be a member. 6.3 Some have argued that the rights conferred on individuals by EU citizenship might influence the European Court of Justice (ECJ) to somehow resist this outcome. But this is a matter for speculation and does not have a clear precedent in EU law. It would also require the issue to somehow come before the ECJ, which may be unlikely. 7. In any event, Scotland’s position within the EU is likely to be shaped more by any agreements between the parties than by pre-existing principles of EU law. ^ "Unionists urged to sign EU letter". The Herald. 31 January 2013. Retrieved 5 February 2013. ^ "Scottish Independence: Blair Jenkins answers your questions". BBC. 18 January 2013. Retrieved 5 February 2013. ^ Crawford, James; Boyle, Alan (10 December 2012). "Annex A - Opinion: Referendumon the Independence of Scotland – International Law Aspects" (PDF). Retrieved 19 February 2013. ^ "Sturgeon: UK 'arrogant' over Scottish independence". BBC. 11 February 2013. Retrieved 19 February 2013. ^ "'Better Together' - Alistair Darling delivers the John P Mackintosh lecture". 10 November 2012. Archived from the original on 14 October 2013. Retrieved 5 February 2013. ^ Van Parijs, Philippe (4 October 2007). "Brussels after Belgium: fringe town or city state ?" (PDF). The Bulletin. Retrieved 29 November 2007. ^ Feki, Donya (29 November 2007). "Jean Quatremer: a nation has been born—Flanders". Café Babel. Archived from the original on 9 March 2010. Retrieved 29 November 2007. ^ "Turkish Cypriot community". European Commission — Directorate-General for Enlargement. 3 January 2007. Archived from the original on 10 December 2010. ^ "Outcome of the special European Council (Article 50) meeting of 29 April 2017" (PDF). European Parliament. 1 May 2017. Retrieved 26 December 2017. ^ "Treaty establishing the European community, last revision from Nice 2001, Art.299(6)a". Eur-lex.europa.eu. 1 January 2004. Retrieved 7 January 2011. ^ Helena Spongenberg. "EUobserver.com". EUobserver.com. Retrieved 7 January 2011. ^ "Greenland could re-join the EU". EUobserver Review. 5 January 2007. Archived from the original on 20 January 2008. Retrieved 25 June 2007. ^ "Treaty of Lisbon Article 2, point 293" (PDF). ^ "Countries - Pacific - New Caledonia - Information Paper - NZ Ministry of Foreign Affairs and Trade". Mfat.govt.nz. Archived from the original on 28 January 2013. Retrieved 9 December 2013. Relations between Moldova and the European Union (EU) are currently shaped via the European Neighbourhood Policy (ENP), an EU foreign policy instrument dealing with countries bordering its member states. Before Kosovo declared its independence in 2008, Kosovo unilaterally adopted the euro as its currency in 2002 when it was under a United Nations mandate, although, it was not an official eurozone member.